A spectacular knife for anyone whose interest is peaked by the idea of slaying zombies, the Skull Camo Spring Assisted Knife with Green Handle features a 3.5 inch hybrid style blade and a vibrant green aluminum handle. Allowing for its quick access and use, this knife has a pocket clip and the blade opens with ease due to a spring mechanism. The blade is crafted from stainless steel and features an eye catching gray skull camo finish. Furthering the attractive appearance of this pocket knife, the green handle features a biohazard symbol accent upon its center. To achieve a lightweight design the handle is crafted from aluminum. 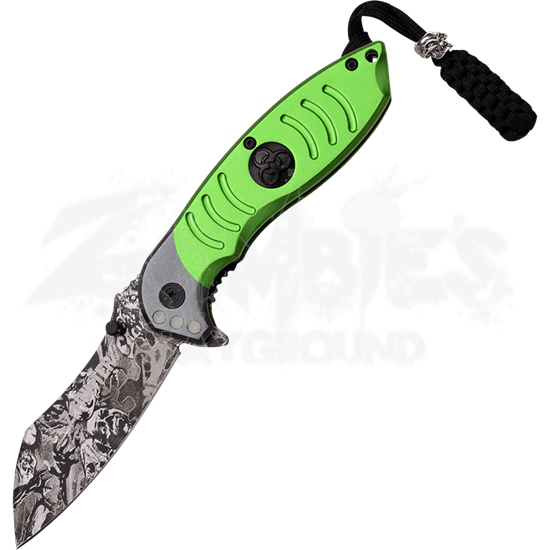 Ensure your preparedness in the case of a zombie apocalypse with the Skull Camo Spring Assisted Knife with Green Handle.